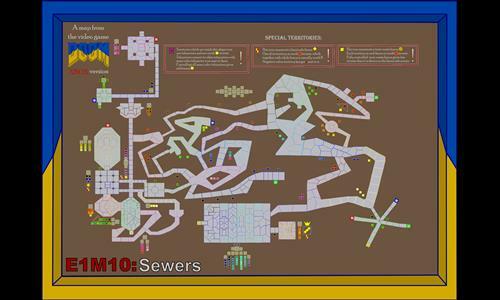 This map may not be perfectly balanced for FFA or 1v1 games, So if you find this map to be such, you should adjust bonuses values yourself to make them balanced for your game. This map features negative value bonuses which icons are not shown on the map. In case you notice, that someone has set one of them secretly to high value, you can discover that bonus by hovering over territories names. Their names are same as bonuses'. I did my best to ensure that all territories which connect at least via corners have got connection between them. If you find any 2 territories on the map which definitely touch but don't connect, inform me about them and they will be connected swiftly. Review by Nathan on 8/13/2014. Wow! Ten zillion distribution modes! They really make the board an excellent play. Nice job. Review by okasan on 8/13/2014. Like the other Doom-based map, this makes for slightly surprisingly good game play: not as hard as it is much larger, but still sufficiently difficult to make it a challenge against the AIs. Plenty of choke points here, in fact, the linear nature of the lay-out makes the end game slightly tedious, but overall very enjoyable. One missing link in the TZG zone, I think it was CT3 to SET5. Thanks, I fixed the connection. Once this map gets updated, it should be fine. Review by Andalorium on 1/25/2017. Awesome, normally maps of preexisting thing, like countries, games etc. don't always work out but this one is great, not to mention decent size too. Avoid the portals/negative bonuses in early game play.